Review of Grasso, ed. - "BLOODY ENGAGEMENTS: John R. Kelso’s Civil War"
In 1861, Buffalo, Missouri (Dallas County) schoolteacher John Russell Kelso embarked on an incredibly varied and eventful Civil War career, and his memoir reveals much about the irregular conflict in the southwest part of the state. Kelso's "Auto-Biography" disappeared at the time of his death in 1891, but an important part of it covering his life story up to 1863 (copied in Kelso's own hand) was discovered and survives. It is the Civil War sections of this manuscript copy that historian Christopher Grasso has edited for release as Bloody Engagements. Though hazy on dates and tainted throughout by heavy doses of immodesty, Kelso's highly descriptive writings nevertheless offer valuable firsthand views of a host of lesser-known wartime events that occurred in Missouri and Arkansas. His frightening portrait of life behind the lines in a rural Ozark county, with each side's adherents alternately preying upon the other, is an especially revealing one [no stranger to stealing from enemy sympathizers, Kelso would have his own house and farm destroyed by vengeful neighbors]. Many of the narrative's gaps and deficiencies are ably remedied in Grasso's footnotes, which also regularly temper Kelso's flightier claims with accounts of the same events from other sources. As his memoir demonstrates at great length, Kelso served the Union cause in many different capacities. Although, like many fellow pro-Union Missouri residents, Kelso joined a Home Guard regiment, his personal motivations appear to have been primarily ideological (vs. localist) in nature. In the summer of 1861, while operating in the countryside against secessionists, Kelso and his Dallas County Home Guard comrades missed the Battle of Wilson's Creek. Kelso soon after enlisted in the 24th Missouri Volunteer Infantry. He and his regiment initially conducted antipartisan sweeps in the SE Missouri "Bootheel" and guarded bridges from enemy raids. As with Wilson's Creek before, the October 21 Battle of Fredericktown was fought without him. The 24th then joined General Samuel Curtis's Army of the Southwest for the winter campaign into SW Missouri and NW Arkansas that would lead to the Battle of Pea Ridge, which Kelso also missed after being detached from his unit in February for recruitment duty back in Missouri. Being both trustworthy and familiar with the Missouri Ozarks region, Kelso was frequently detached by Curtis for solo scout/spy missions behind enemy lines in SW Missouri. According to his own accounts, these were thrilling escapades replete with daring acts of deception and narrow escapes that in the end successfully produced valuable intelligence for his superiors. However, the narrative doesn't provide any specific examples of Kelso's information shaping his commander's planning. In March 1862, Kelso took up arms in yet another unit, when he and his recruits (with Kelso appointed first lieutenant) were transferred into the 14th Missouri State Militia cavalry. The federally-sponsored MSM regiments were vital to suppressing guerrillas and maintaining Union control over the state, yet their actions during the war, along with the men and units involved, remain only sparsely recognized in the published literature. 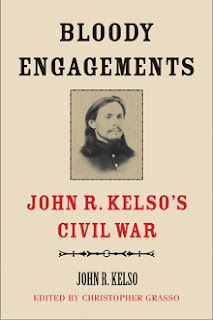 Thus, Kelso's extensive writings of this particular period of his Civil War service represent a very valuable firsthand record of the 14th's leadership and contributions to the Union war effort in Missouri. In addition to documenting a number of 1862 patrols conducted by his MSM unit in Missouri and Arkansas, Kelso recounts in great detail the 14th's combat history, which included an embarrassing rout at Neosho on May 30, a victory at Ozark on August 1, and a successful August 4, 1862 skirmish at Forsyth (for the last, Kelso was not present but includes a copy of his captain's AAR). Kelso also describes at length what he witnessed of the January 8, 1863 Battle of Springfield, where he led a mounted flank guard detachment east of the town. Kelso's narrative is highly informative regarding the concealment, deception, ambush, surprise, and shock tactics employed by both sides during irregular and counterirregular operations in the Missouri countryside. The depths of violence and contradiction inherent to the state's unconventional war also grimly emerge. At one point, Kelso hotly opposes the cynical plundering and sexual misconduct of his fellow officers of the 14th, but he also freely admits earlier to robbing and threatening civilians himself, even going so far as to deliberately murder an unarmed old man and seriously wound a young boy inside their home. At the rear of the book, Grasso appends to the memoir narrative the texts of two Kelso speeches, as well as an unfinished late-life work (titled Government Analyzed) that questions the war and the part Kelso played in it. According to Grasso, Kelso became a self-described "anarchist" in the years before his death, and the rhetoric contained in many of the bizarre passages in Analyzed seem to support this radicalized outlook [ex. "This war is known to have been the result of a vast conspiracy of the capitalists of Europe and of America" (pg. 207)]. Though the memoir ends abruptly, the book's biographical chronology finishes Kelso's Civil War story, which was highlighted by further irregular service in Missouri, election to the House of Representatives in 1864, and brevet promotion to colonel. Editor and publisher are to be applauded for bringing to print a military memoir of Civil War Missouri that represents both the conventional and unconventional aspects of the conflict as uniquely as this one does. Bloody Engagements is highly recommended. Grasso is also working on a Kelso biography, and this volume's fascinating insights into the Union officer's controversial life certainly heightens the anticipation level for it. I haven't read this one yet, been meaning too though. I have been reading more about the war in Iraq lately, The Killing Flower by WK Dwyer. I need to get back to the Civil War reads, they are my favorite!